I live in Philadelphia, which along with Salt Lake City, has to be one of the worst cities in America for a wine blogger: In Pennsylvania, you can only buy wine from the state-run Pennsylvania Liquor Control Board (PLCB); it is technically against the law to buy wine outside of the state and bring it back to the Commonwealth (New Jersey is a scant three miles from my house, but I am not legally allowed to buy wine there); there are very few wineries that will ship to the state as that is also technically illegal (I say “technically” since, quite frankly, the law is unconstitutional, but it is still on the books); ordering wine out at dinner is no fun either since restaurants are required to pay retail for the wine from the PLCB and then mark it up between 300-400%. It is far too depressing. Tastings with a view of the Hudson River are always nice. There is one semi-redeeming factor, however: Philadelphia’s relative proximity to New York City. The East Coast wine mecca is a scant two hours away by car, bus, or train and I try to get up there at least a few times a year for tastings. I always have a bit of melancholy when I head up the I-95 corridor for one of these “trade tastings” (it is still a bit surreal to consider myself “part of the trade” but that usually goes away with the first pour), since during the Fall and Spring, it seems as though there is at least a few tastings a week and often several on any given day. Why does that depress me? In Philly there are none. In a city with one and a half million people, you would figure there would be the occasional trade tasting, but thanks to the state monopoly on wine and liquor sales, there is absolutely no reason to have them here. OK, my 738th rant about the PLCB is now over. In other words, a tasting right in my wheelhouse. Simply put, for those other Pinot and Chard fans out there, this tasting, which is held annually in New York and San Francisco (this year they added Houston), needs to be on your radar. I guarantee you will not be disappointed as Jasmine and Raj bring together about three dozen of the best California producers of those two magical varieties, each pouring 3-6 wines. Last year, I went up to the tasting with Joe Roberts (aka 1WineDude), but this year Joe couldn’t make it, so I was flying solo, which was a good thing since I was running a bit late. Eventually, I made it to the tasting, with only a few hours to get through the wines. There was no possible way to get through them all, so I did not even try. 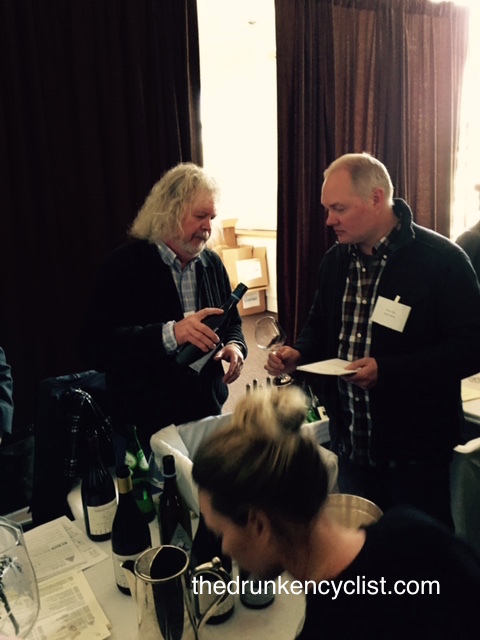 What I did try was impressive, though, starting with Au Bon Climat, where the legend Jim Clenenden was pouring several wines. This was a mistake, since his Chardonnays, in my opinion, were fantastic, and the others at IPoB would struggle to keep up. The 2011 Au Bon Climat Nuits-Blanches au Bouges Chardonnay ($35) had great fruit and subtle oak, with a lingering finish and really was superb. 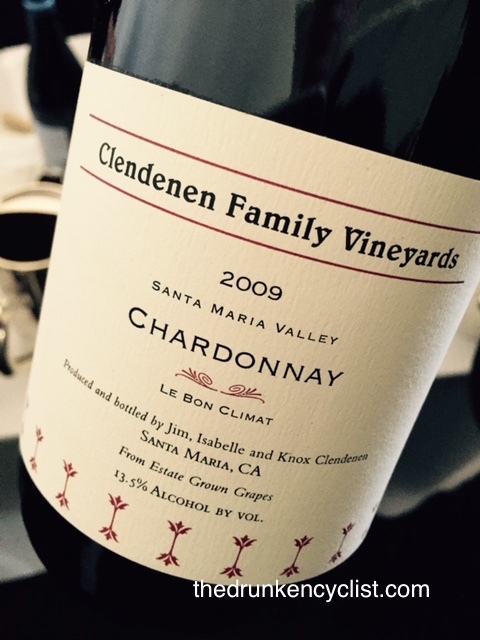 It likely would have been the Chard of the show (91-93 Points) had it not been for the 2009 Clendenen Family Le Bon Climat Santa Maria Valley Chardonnay ($50), which was still quite young, but wholly cow was it impressive. I immediately thought “Premier Cru Meursault with better fruit.” This is a wine that still could use some more time, even six years out (93-95 Points). Meeting and chatting with Ted Lemon of Littorai was a highlight. Other Chardonnays that stood out were the 2013 Failla Haynes Vineyard Chardonnay Coombsville ($58), which was a bit buttery and oaky for Failla, but delicious, the 2012 Matthiasson Michael Mara Vineyard Sonoma Coast Chardonnay ($45? ), which also had some noticeable oak, but was spot on, and the 2012 Hanzell Vineyards Sonoma Valley Chardonnay, where the oak was more subtle, but the fruit was just as rich. On the Pinot side of things, there were several impressive wines, including the 2012 Copain Kiser en Haut Anderson Valley Pinot Noir ($70)—the fruit was present, but not dominant and the grip on the backend suggested many years to go, the 2012 Flowers Sea View Ridge Estate Pinot Noir ($70) was bright yet powerful, and the 2012 Littorai Cerise Vineyard Pinot Noir ($70) was easily up to the standards that Ted Lemon continues to set. For me, though, the Pinot of the event, like the Chardonnay, came from a little further south. 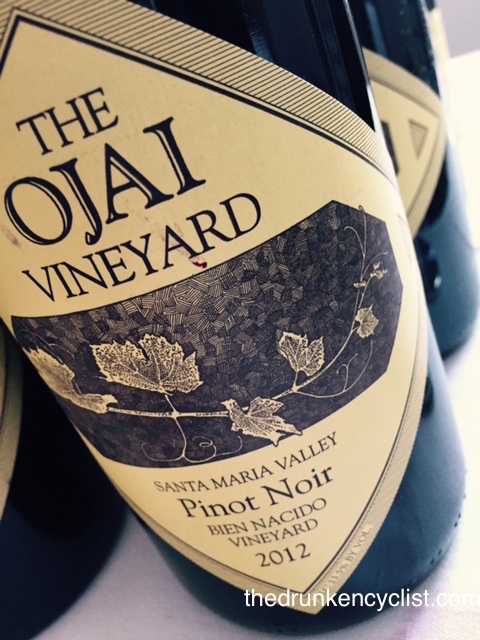 The 2012 Ojai Vineyard Bien Nacido Pinot Noir ($45) was spicy, floral, fruity, and deep. This was one of the last wines that I tasted on the day, but it was clearly one of the best (92-94 Points). This entry was posted in Chardonnay, Pinot Noir, Wine, Wine Tasting and tagged Chardonnay, Clendenen Family Le Bon Climat Santa Maria Valley Chardonnay, Matthiasson Michael Mara Vineyard Sonoma Coast Chardonnay, Pennsylvania Liquor Control Board, Pinot Noir, PLCB. Bookmark the permalink. I also live in Philly so I feel your pain. We have also researched and made note of all the Wine & Spirits stores that are open on Sundays! 🙂 When I first moved here I thought it was weird that there were ‘beer distributors’ and then I sadly discovered that beer was not sold in regular stores! In New York, where I’m from, it was available pretty much everywhere! I’ve since adapted, but it hasn’t been easy! You are also in Philly? We should get together, pull a few corks, and chat. I hear there are ways to “get around” the unfortunate situation. At least I hear that…. I’m going to the SF tasting on Monday! You post makes me look forward to it even more! 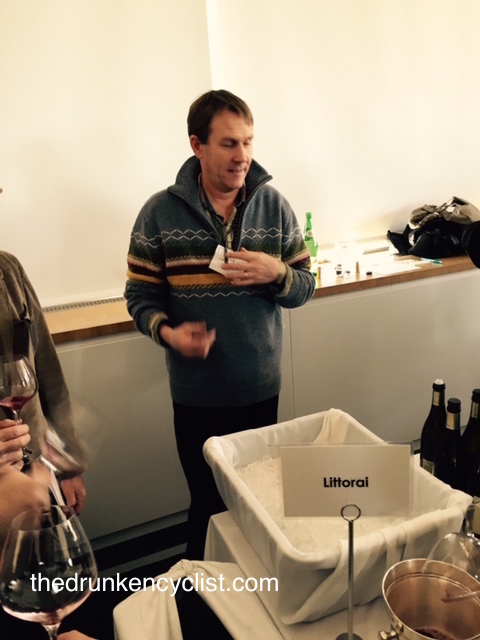 It really is a grand tasting–enjoyed your recap! 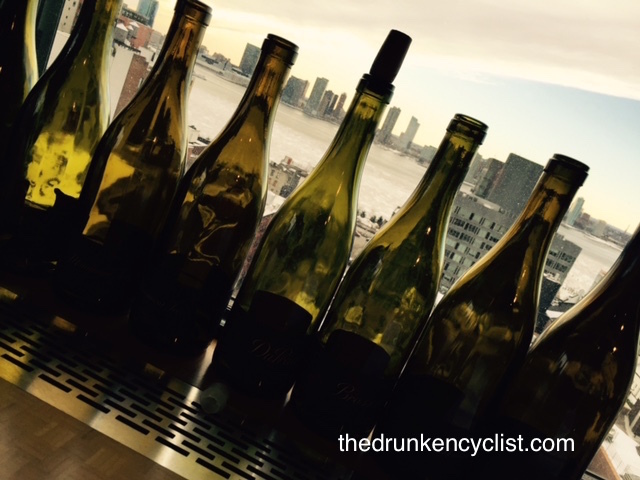 Next time you’re in NYC check out Brooklyn Oenology if you haven’t already. If you’re staying in Manhattan it’s a quick jaunt on the l (pick up along 14th Street; Bedford Ave stop which is the first in Brooklyn will make a quick walk of it). I did a fairly interview and subsequent write up over at winedom.com (http://winedom.com/wine-sights/brooklyn-oenology-wine-tasting-room.php) – definitely my new favorite wine spot in the city now that Kashaval is closed (moment of silence, please). 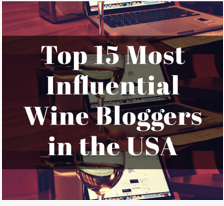 I’m looking forward to moving back to the East Coast – so much is going on with wine there. Did you hear JERSEY is supposed to be the next hot wine region? JERSEY?! I’d love to check out some tastings like this once I’m back in a more wine-friendly part of the country. MI isn’t nearly as bad as PA but our local production is limited and not very good. Thanks for another educational post! In Cleveland we have most of the problems you mentioned AND we are even further away from NYC… I just wish restaurants would drop the ridiculous wine pricing. What keeps that system afloat??? I ranted a while ago about wine mark-ups in restaurants (http://wp.me/p28FPy-14a) and the shortest answer as to why they do it? Because they can and people keep paying the ridiculous prices…. Not me! I won’t buy a bottle though I admit I will buy it by the glass. It is hard to get away from the idiocy that is the PLCB. If i thought it would do any good, I would crawl to Harrisburg backwards…. I would move to Europe tomorrow if my wife would come on board…. wait…wait…another solution…i have good friends here in italy, some grandparents of al capone…mmmhhh…should i ask them to bring you some good wine every week…??? Every time I read one of your rants about the PLCB I have to remind myself that there ARE places in this great US of A that have stupider (ha! not even a word!) laws than Oklahoma! At least that is ONE ratings list that we are not at the bottom of. Yeah, glad we could help! Unfortunately, when I say it, I am pretty sure that there are no states with “stupider” laws than our lovely Commonwealth!